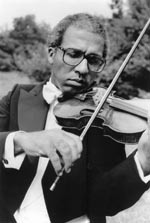 Sanford Allen, the first African American violinist to become a regular member of the New York Philharmonic Orchestra in 1962, is connected to 23 works in 34 publications in 4 languages and 711 Library holdings. See http://rdap02pxdu.dev.oclc.org:6251/identities/lccn-no92-31626. Mr. Allen will perform solo selections in addition to a duet with violist Nokuthula Ngwenyama during 150th Anniversary Emancipation Proclamation Concert, September 22, 2012, AT&T Center Theatre, Los Angeles. See http://musicuntold.com/index.php/150th-anniversary-emancipation-proclamation-concert/.